1. Measure and cut your copper pipe to length, using a sharp Pipe Cutter. Saws will leave a rougher edge. This makes more work, since any rough edges will require reaming and sanding to make them square and smooth in order for the pipe to bottom out in the fitting. 2. Use the built-in Reamer, or the blade of a pocket knife, to remove the ridge from the inside of the fresh cut. This makes for a smooth transition from pipe to fitting. Calcium and other mineral deposits will adhere to any rough edges. Over time, this build up will cause blockage and reduced flow. 3. Remove any oxidation, discoloration or sharp edges from the first inch of pipe, using fine sandpaper or crocus cloth. Even if it looks clean enough, dirt and oils from your hands can contaminate the joint surface. 4. Clean the inside of the fitting before applying flux and soldering. Keep in mind, especially if you buy single fittings from an open box at Home Depot or Lowes, etc., people often pick them up with dirty/oily fingers. Any contaminants inside of a pipe joint can also affect the spread of plumbing solder. Even bulk/bagged fittings contain trace amounts of oil to prevent oxidation. 5. Wipe the pipe end and fitting with a clean cloth, to remove any residual oil or grit. Do not forget to remove any moisture from the inside of the pipe joint. Moisture can prevent even-heating, and interrupt the flow of solder around the joint. You can dry it out by using a rag or applying a little bit of torch heat in advance of the next step. 6. Brush a light coating of Tinning Flux onto both mating surfaces, before assembling. When melted, the silver bits will 'tin' the surface allowing the Solder to spread quickly and evenly. 7. Ignite your torch and heat the fitting all the way around the seam. Pass the flame back and forth to spread the heat evenly, with your Solder at the ready. Test periodically, by backing the flame away and touching the solder to the joint. 9. Quickly inspect the joint to see if the Solder has traveled all the way around. Reapply heat and Solder as necessary. Better to apply 'too much' than not enough! Wipe away any excess, using a dry rag, before the solder cools. * An old plumber's trick for stopping a very light drip, while attempting to solder a plumbing joint, is to stuff the end of the copper pipe with bread. Be sure to fully open a cold water hose bib to flush out the bread, as you recharge the system. Remove faucet aerators, to prevent clogging from any small particles which may break loose due to vibration. 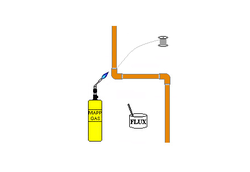 * Since Mapp Gas burns hotter than Propane, take care not to overheat and discolor the copper. * In extreme cases, overheating can misshape the copper pipe or fitting. * To quickly cool off the workpiece, Use a plant Spray Mister or a bucket of water as a plunge bath. * When soldering a ball valve, open the valve and wrap a small damp cloth around the housing, just below the handle. This will protect the seal from heat damage. * Propane has a flame temperature of around 3,540°F ( 1950°C ) and can cause third degree burns very quickly! * Replace wet gloves immediately, since heat will travel through them. * Avoid breathing fumes from soldering. 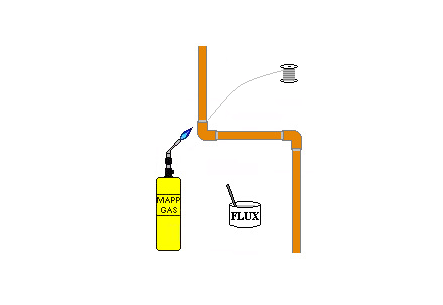 Flux contains Rosin which is an allergen and may cause respiratory system irritation and damage. * Other types of Solder may also contain Lead which, when inhaled, can damage Blood and Organs, cause cancer and birth defects or other reproductive harm. * Use a store bought plumber's heat shield or sheet metal to prevent any flammable/combustible materials from igniting in tight quarters. * Always keep a water source or fire extinguisher nearby, as a precaution.